Because a beautiful sweater is timeless (and more importantly, like a blanket you can actually wear outside). Just when you thought winter could possibly be starting to ease up, it snows. At the end of February. In London, Paris and even Barcelona. So don’t pack away your knitwear just yet. On the contrary, now is the perfect time to invest in deliciously luxurious knitwear that is both highly necessary and also, rather conveniently, on sale. Wrap up warm kids, spring isn’t quite here yet. Unlike so many knits, a good cable knit sweater won’t pull, meaning it’ll actually last you countless winters to come. I’ve been living in this Acne cable knit in brown; easily one of the most versatile jumpers I own. The antidote to endless grey days? A rainbow knit. Minimalism is dead; embrace bold colours, it’ll put a smile on your face, I promise. 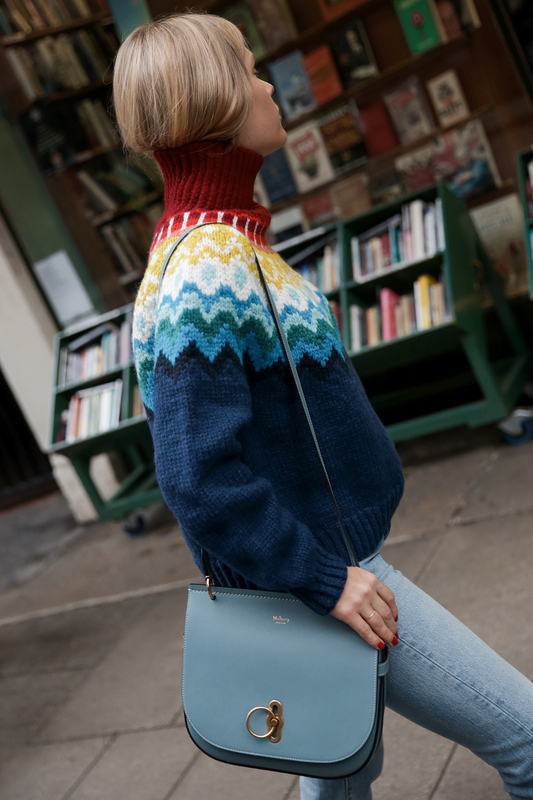 And if you’re not sure you can pull off a canary yellow jumper or a multi-coloured knit, I suggest taking a peruse at Ganni’s offering; their playful knitwear can convince even the most staunch minimalist to come on baord. The roll-neck is timeless, not to mention a sweater and scarf in one (win, win). To give this classic sweater an easy update, keep your locks inside the neckline; and voila, a chic hair tuck. When staying in bed isn’t an option, a super-soft fluffy knit comes a close second. The softer the better; the fluffy sweater is all about taking cosy to the next level, whilst still being super luxe. To say I have a soft spot (get it?!) for these Mulberry sweaters is an understatement. Normally I’m not a get-it-in-every-colour kind of gal, but I have no regrets about doubling up on the most delicious knit ever to grace my wardrobe. The perfect jumper to indulge in a little 70’s nostalgia (or pretend that you’re headed to your country house this weekend). Style this vintage-inspired knit with pretty much anything; denim, tailored trousers, or even your favourite day dress. And if you’re not convinced you want to invest just yet, your local charity shop will likely have an abundance of fair isle sweaters (that are actually vintage). Because sometimes big is better, especially when icy temperatures are involved. Ideal for layering over top of thermals when desperate times call for desperate measures, plus oversized knits always manage to look effortlessly cool with pretty much every single item in your wardrobe.